At PFLAG’s Annual Meeting, President Stan Griffith presented a copy of Courting Equality to Carla Yengo-Kahn for the Lexington High School Gay Straight Alliance. 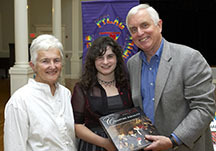 Author Pat Gozemba (left) noted that the donation of a copy of the book would be made to each of the 241 GSAs in Massachusetts thanks to a generous donation to PFLAG by Chip McLaughlin and Keith Maynard. McLaughlin and Maynard will alsoÂ offer through PFLAG a copy of the book to each of the public high school libraries in schools thatÂ do not have GSAs. This means that shortly there will be a copy of the book in each public high school in MA. “Greater Boston PFLAG beleieves that we can create safe and welcoming schools, communities, and places of work through education and dialogue. Distribution of Courting Equality is one way that we can educate and promote dialogue,” said Griffith. Members of Mass Resistance, including Brian Camenker, who have been focused on dismantling GSAs attempted to crash the annual meeting but were asked to leave. This entry was posted in civil rights, Gay Straight Alliances, Massachusetts. Bookmark the permalink.